Even before the supercommittee’s demise, the defense industry and its Pentagon and congressional allies were making preemptive strikes on the next phase: the automatic cuts, half of them from defense, that are supposed to follow the supercommittee’s failure. And with national unemployment rates stuck near 9 percent, the effect of these cuts on jobs has loomed large in their sights. The Aerospace Industries Association claims to be a top job creator, but independent studies show just the opposite. Photo by US Army Africa. 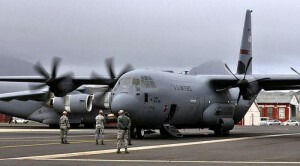 The largest defense industry trade association, the Aerospace Industries Association, recently funded a study predicting $1 trillion in military cuts over 10 years would add 0.6 percent to the national unemployment rate. The Pentagon then funded its own study that conveniently rounded that prediction up to an even 1 percent. The glaring flaw in these studies is that they make claims about the effect on the economy as a whole as if these military cuts were being made in a vacuum. The real world is a world of trade-offs. 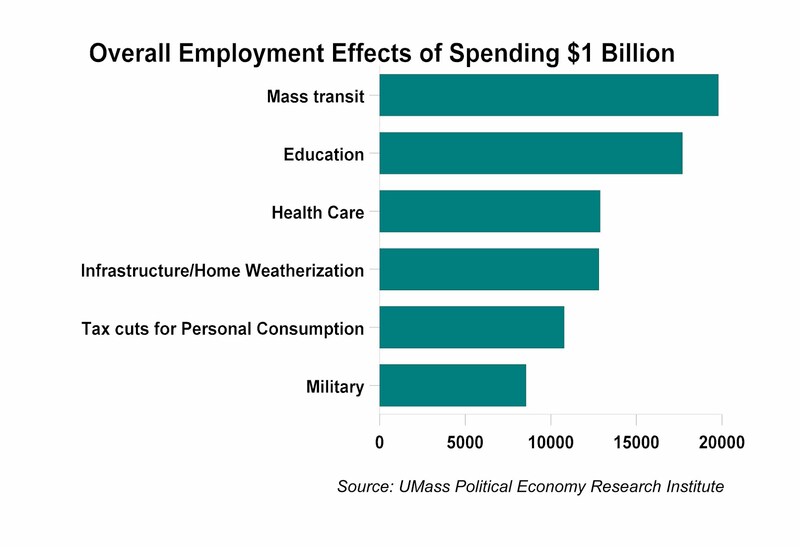 If you’re serious about examining the employment effect of these cuts in the military budget, you have to ask whether doing so would cost more or fewer jobs than doing something else with the money. New analysis by economists Robert Pollin and Heidi Garrett-Peltier at the University of Massachusetts provides the answer. Unlike the studies from AIA or the Pentagon, it is an independent analysis. It was funded by no industry or government agency — that is, no institution with a special interest in the outcome. Updating their previous studies from 2007 and 2009, Pollin and Garrett-Peltier compared the effects on jobs of spending an equivalent amount on the military, on clean energy, healthcare, education or simply returning the money to the private economy in the form of tax cuts. Among these options, military spending was the weakest job creator. The number of jobs in each category has changed slightly compared to their earlier work — $1 billion doesn’t buy you as many jobs of any kind as it used to — but the overall conclusion is the same. Cutting military spending would cost fewer jobs than all these other options by a factor of between 50 percent and 140 percent. The larger flaw in the effort to head off defense cuts with inflated jobs claims, of course, is that military spending is not supposed to be a jobs program. We ought to decide which military systems effectively defend our nation, then fully fund those programs and no others. Investing in our national military is like buying insurance. Since insurance purchases don’t do anything to improve their standard of living, families should only buy as much as they need to secure themselves from disaster. Likewise, societies need to buy as much military insurance as they need, but to spend more than that is to squander money that could go toward improving the productivity of the economy as a whole: with more efficient transportation systems, a better educated citizenry, and so on. This is the point that retiring Rep. Barney Frank (D-Mass.) learned back in 1999 in a House Banking Committee hearing with then-Federal Reserve Chairman Alan Greenspan. Frank asked what factors were producing our then-strong economic performance. On Greenspan’s list: “The freeing up of resources previously employed to produce military products that was brought about by the end of the Cold War.” Are you saying, Frank asked, “that dollar for dollar, military products are there as insurance … and to the extent you could put those dollars into other areas, maybe education and job trainings, maybe into transportation … that is going to have a good economic effect?” Greenspan agreed. One trillion dollars in military cuts over 10 years would bring us, in real terms, to the same level we spent in 2007. More than we spent during the Cold War. As much as the rest of the world put together. More than enough insurance.